The last year has been a bumper one for Intense Cycles. Over the past 12 months, the Southern Californian brand has released four key new models to wide critical acclaim. That includes the Spider 275 trail bike, the ACV plus bike, the Primer 29er, and this gorgeous machine: the Recluse. The 140mm travel Intense Recluse. Aside from the Spider, all of these bikes are wearing brand new names badges, but all four have been completely designed and engineered from the ground up. 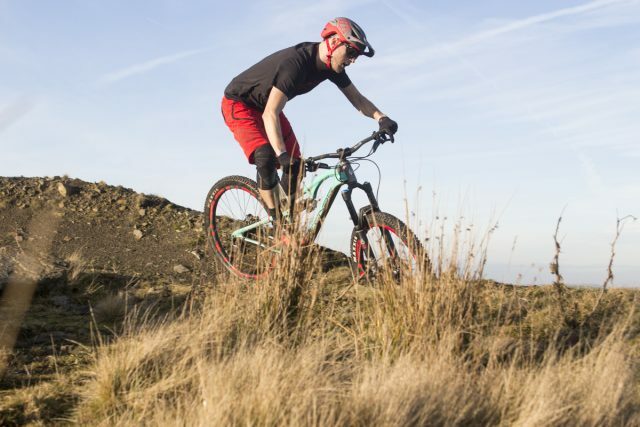 Far from simply being updates of existing models dolled up with some new standards and in-vogue tyre sizes, these new bikes possess wider wholesale changes, and represent a significant shift in gear for Intense as a brand. Although Intense has been around since the good ol’ days of early World Cup DH racing, the brand has traditionally occupied the small-time boutique space alongside other well-known US brands like Yeti, Santa Cruz and Ibis. However, some recent changes to the company structure, plus a new and ongoing commitment to working with carbon fibre has seen Intense grow with significant pace over the past few seasons. 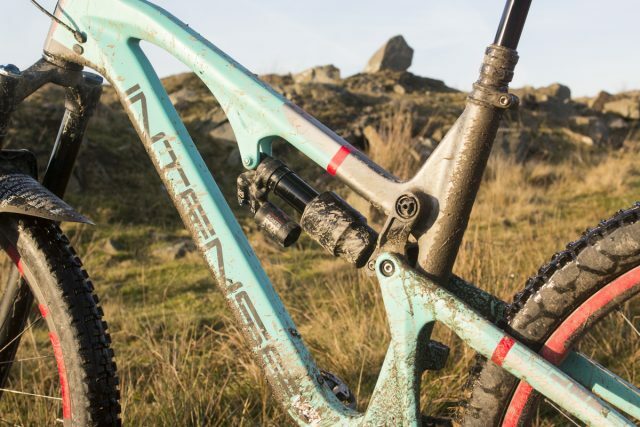 And despite it’s previous ‘Made In The USA’ ethos and alloy-only product line, it hasn’t taken long for Intense to rewrite its internal constitution to make way for more desirable high-performance mountain bikes that are sending riders and bike media all over the world absolutely gaga. Like the Spider 275, ACV & Primer, the Recluse sets a new precedent for the Intense brand. Like the Primer and ACV before it, the Recluse is a brand new name in the Intense lineup. Pronounced “Wreck-Loose”, the name actually comes from a highly venomous spider found in North America. And that’s the first clue as to exactly what the Recluse is meant to be – a more potent version of the Spider. The Recluse is like a more potent Spider 275. 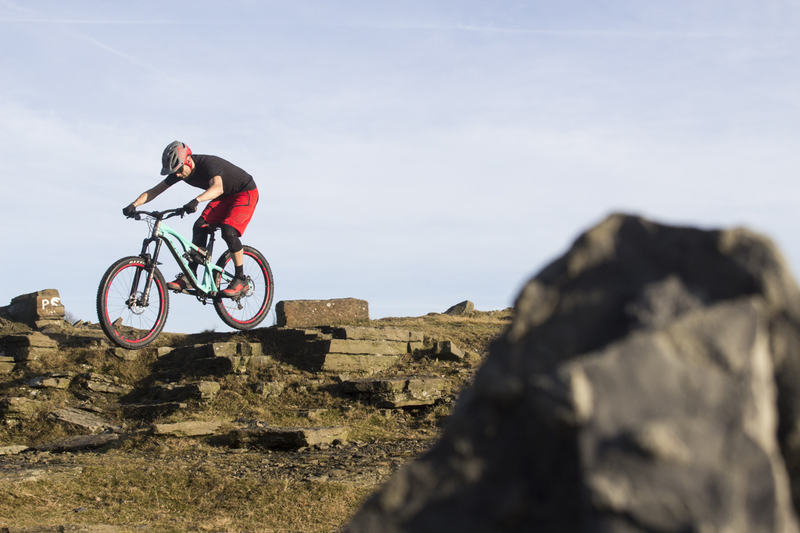 Whereas the Spider was designed as a lightweight all-day trail bike with 130mm of travel, the Recluse builds upon the same foundation, while packing in a few devilish details to give it a little more oomph for getting rowdy where it counts. 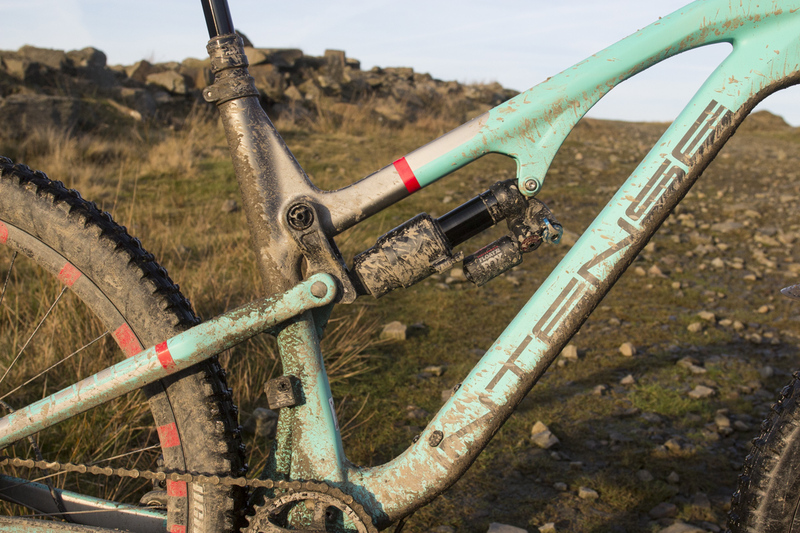 It ups the rear travel to 140mm, and has been spec’d with a piggyback shock and a burly 150mm travel fork on the front. There’s a long front centre and a slack 66° head angle for descending stability, while a snappy 419mm rear centre length aims to keep handling crisp. The end result is a trail bike that Intense has designed to be snappy, pedallable, and responsive, while possessing a little more attitude than your average long-legged trail bike. A Fox 36 fork up front and a 66° head angle give the Recluse a very purposeful look. Unlike Intense models of old, the Recluse is exclusively made from carbon fibre. (No word on whether we’re likely to see US-made alloy versions in the future). There are actually two different grades of carbon available: standard, and SL. They both share exactly the same molds and geometry, and purportedly possess the same strength and stiffness characteristics. However, the SL subs in a higher modulus carbon fibre along with titanium hardware to lob 250 grams off the total frame weight. 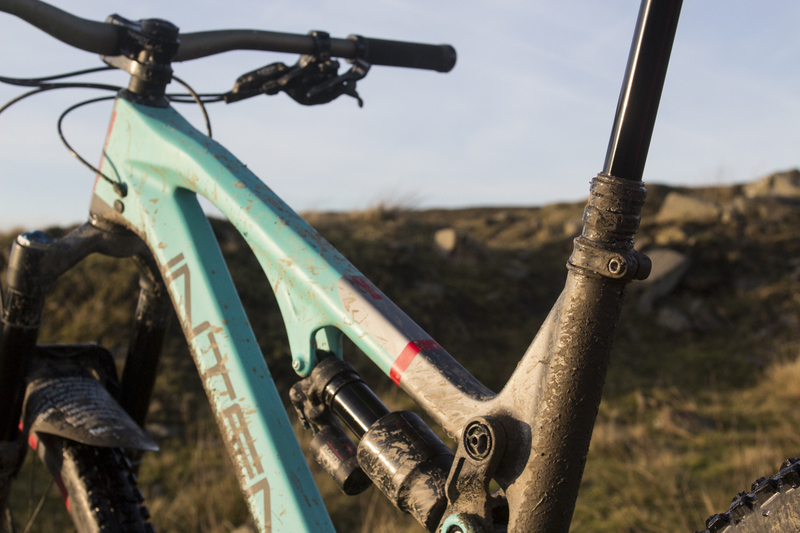 Intense is primarily using the two different carbon fibre frames to access a wider range of price points for its complete bike range. There are five different Recluse models available, with only the top three (including the Elite that we’ve been testing) featuring the pricier SL carbon frame. The Recluse Elite makes use of higher-mod carbon fibre and Ti hardware to drop 250gm off the standard carbon frame. With its stout carbon construction, the Recluse is full of angular lines that give it a purposeful look. The frame features a monocoque front triangle, and a one-piece triangulated swingarm that’s suspended via two small forged alloy rocker links. Dubbed the JS Tuned suspension design, this multi-link arrangement bears many similarities with the VPP suspension platform it replaced. Out with the VPP, and in with the JS Tuned suspension design. Same-same, but different. However, as the VPP patent actually ran out last year, that left the doors open for Intense to rework and rename its dual-link platform. 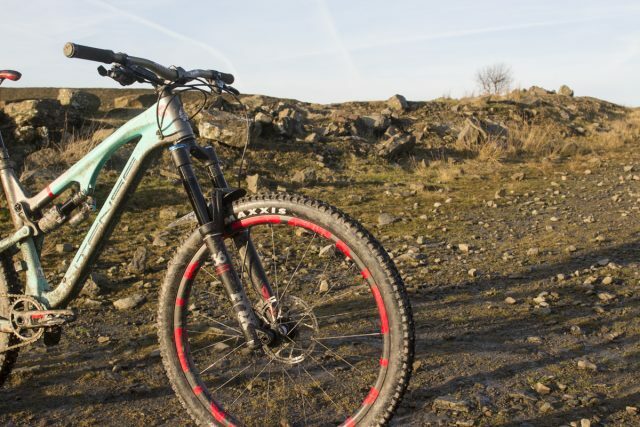 Subtle changes in link shape and orientation have altered the suspension kinematics, with the new design said to offer more mid-stroke support, while still maintaining the excellent pedalling performance of the VPP design. …and a lower link supports the base of the one-piece swingarm. Inside those suspension links, you’ll find angular-contact cartridge bearings with locking collet hardware. The lower linkage has in-built grease ports that allow a grease gun to be used to replenish the internal ball bearings. Pivot hardware has also been updated, with flush end caps that look much neater indeed. Other frame features on the Reculse include a tidy 148x12mm bolt-up axle for the rear dropouts, a PF92 bottom bracket shell, ISCG05 tabs, and a chunky tapered head tube. There’s internal cable routing throughout, with only the rear brake line running externally along the chainstay. Although our Recluse Elite came setup as a 1×11, an upper direct mount on the seat tube allows you to bolt on a front mech should you want to roll with a 2x drivetrain. The Recluse will fit a front derailleur, but it would be nice if the mount was removable. It might not be immediately obvious just from looking at the spec, but the Recluse Elite isn’t actually the most expensive model available in the Recluse line. That spot is reserved for the uber-bling Factory model. 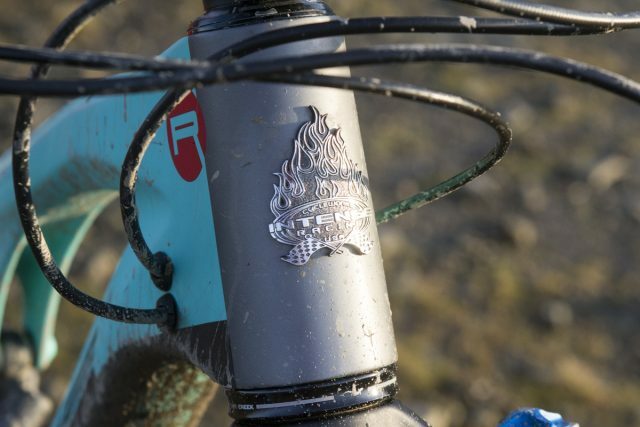 Regardless, the Recluse Elite is packed with some serious chops, and a few more exotic items that you won’t see on every other bike at the trail head. 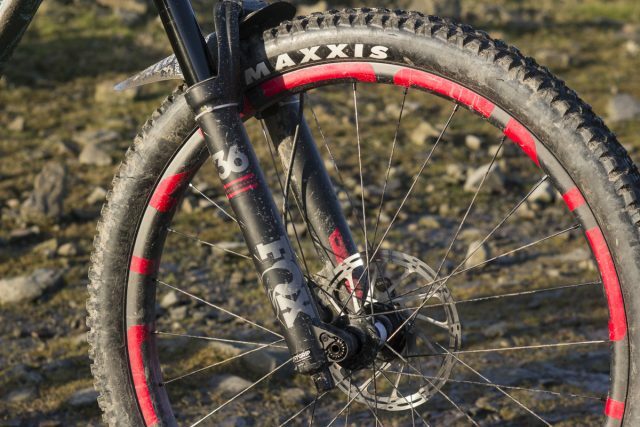 The Recluse debuts Intense’ new carbon fibre rims, which are very good indeed. The main one being the carbon fibre wheelset, which is Intense’s own design. With a 31mm internal width and a shallow profile, the carbon rims aim to offer greater strength than an alloy equivalent, while keeping weight low and responsiveness high. 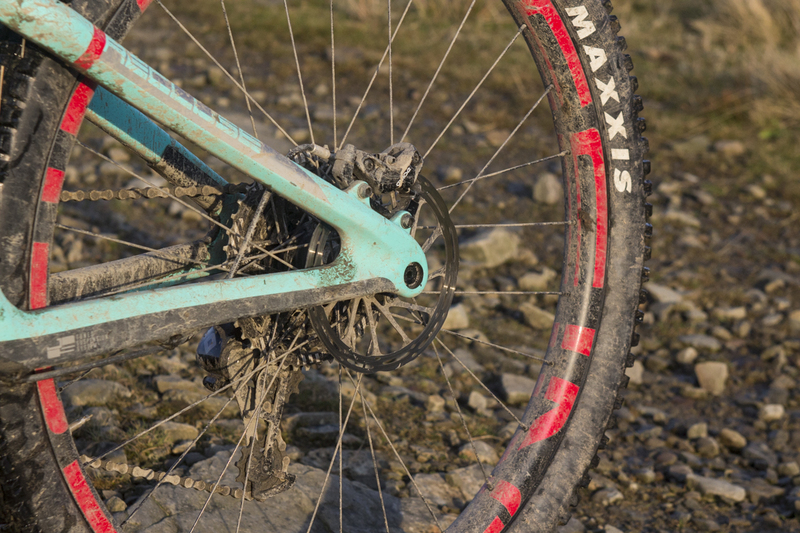 The tubeless rims are shod with sticky 2.3in Maxxis High Roller II treads, and they bolt to the frame via Boost sized DT Swiss hubs. 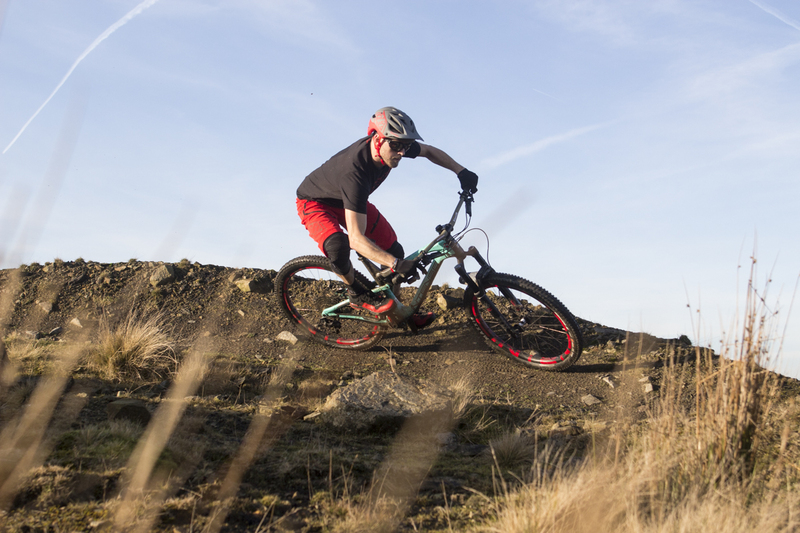 A full-blown downhill air shock controls the Recluse’ 140mm of rear travel. 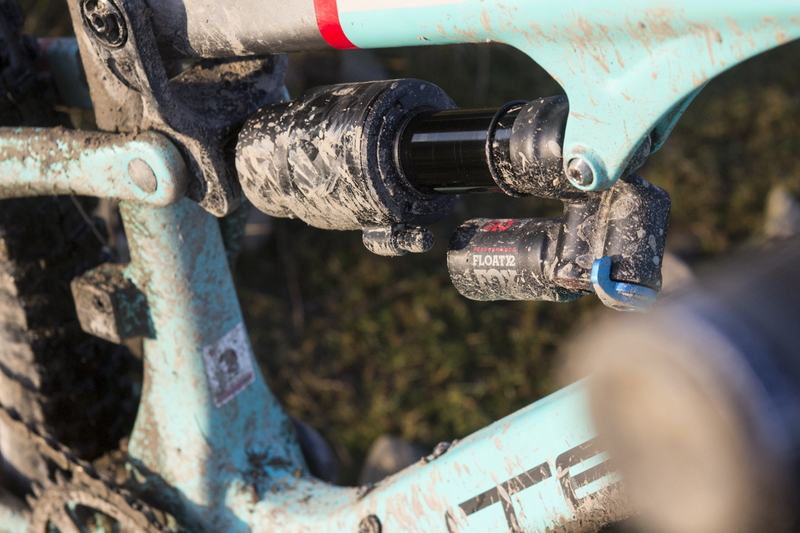 Suspension duties are taken care of by Fox, with a Float X2 shock out back and a 36 up front. Both are Performance Series models, so while they don’t have the same adjustability as the top-end Factory versions, they’re built with the same spring and damper technology to bring big-travel performance to the Recluse’s 140mm platform. 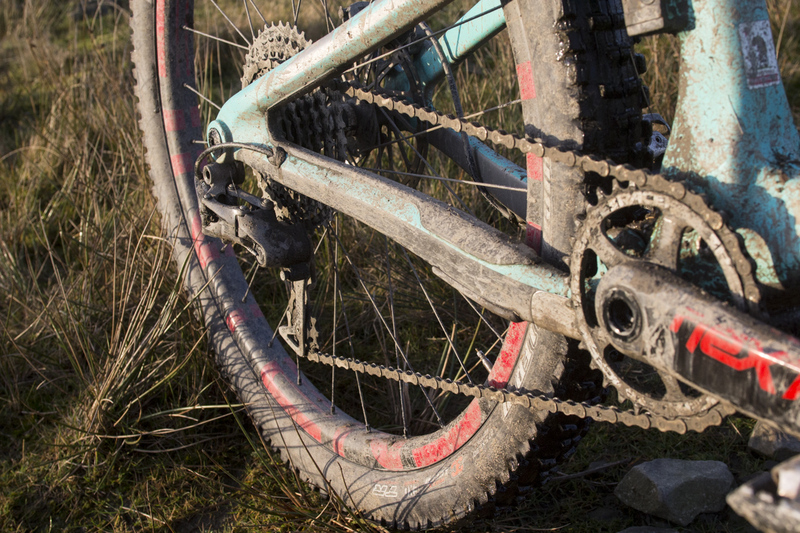 Race Face & E*13 join forces on the 1×11 drivetrain. The rest of the Recluse Elite’s spec is an eclectic mix. There’s a lovely Renthal and Thomson cockpit, along with powerful SRAM Guide RS brakes. The 1x drivetrain looks beyond SRAM and Shimano, with Intense instead choosing the superlight Race Face Next crankset and the brilliant 9-44t E*13 cassette. 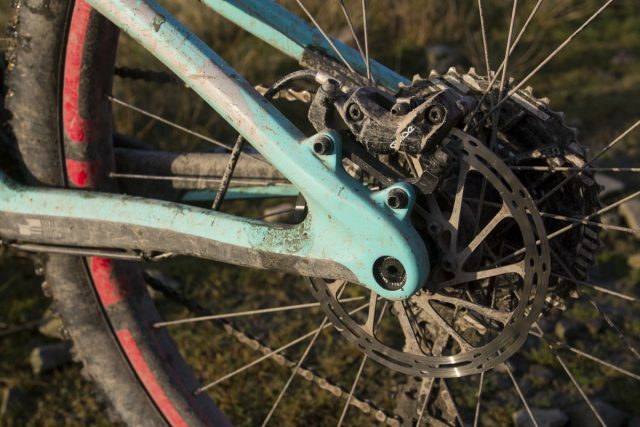 The result is a 1x drivetrain that delivers close to the range of SRAM’s 1×12 Eagle groupset. For our complete bike without pedals and setup tubeless, the Recluse Elite weighed in at 13.13kg. Out of the box, the Medium sized Recluse Elite weighs in at 13.13kg. As with the Spider, ACV and Primer models, the new Recluse is adorned with plenty of contemporary frame numbers, with two distinct themes going on with its geometry. Up front is a slack 66° head angle, and a decent reach measurement of 438mm for our Medium sized test bike that puts most of the wheelbase length between the front hub and the bottom bracket. Along with the beefy 36 fork, wide bars and short stem, the front of the Recluse doesn’t feels unlike a much bigger enduro race rig. The Recluse gets all modern with a long front centre and short 419mm chain stays. Out back however, Intense has used a steep 75° seat angle and a tall 344mm bottom bracket height to help push rider weight forward to accommodate a powerful and efficient pedalling position. 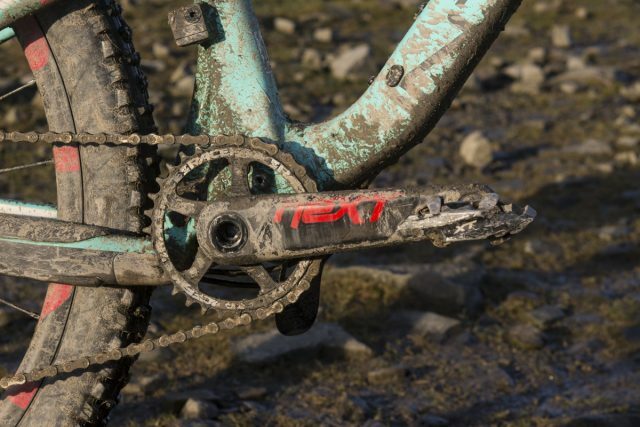 One other number that sticks out is the super-snug 419mm chain stay length. Along with the stiff one-piece swingarm and stout thru-axle dropouts, this creates a tight and taut back end that aims to keep the Recluse’s handling sharp and direct. It all certainly sounds good on paper, but there was one issue that I ran into from day one. 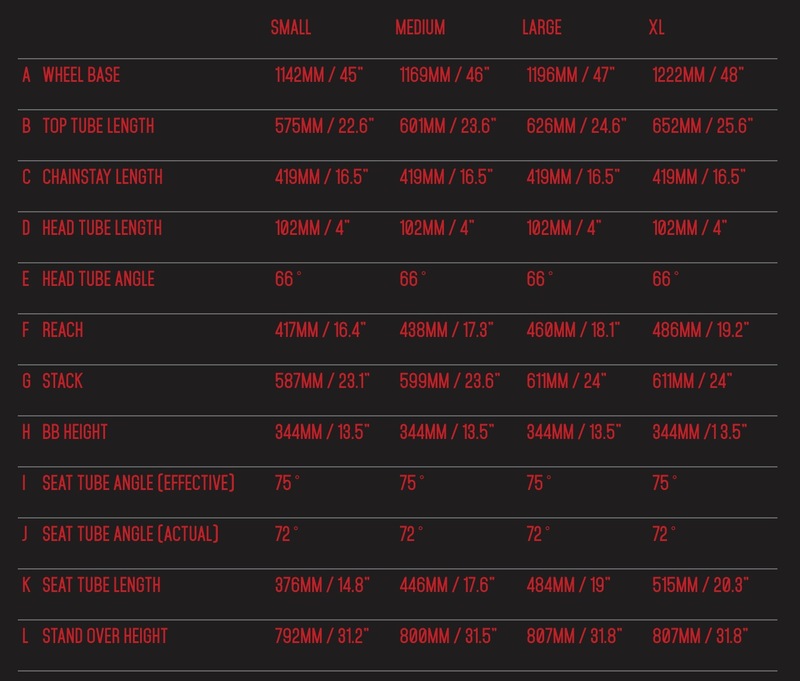 At 446mm in length, the seat tube measures quite long for a Medium frame size. In years gone by, that wouldn’t have been an issue. But now that 150mm and 170mm travel dropper posts are becoming much more common, most brands are employing shorter seat tubes to accommodate these longer seatposts. For whatever reason, the Recluse doesn’t have a particularly short seat tube, and that limits how much drop you can run. 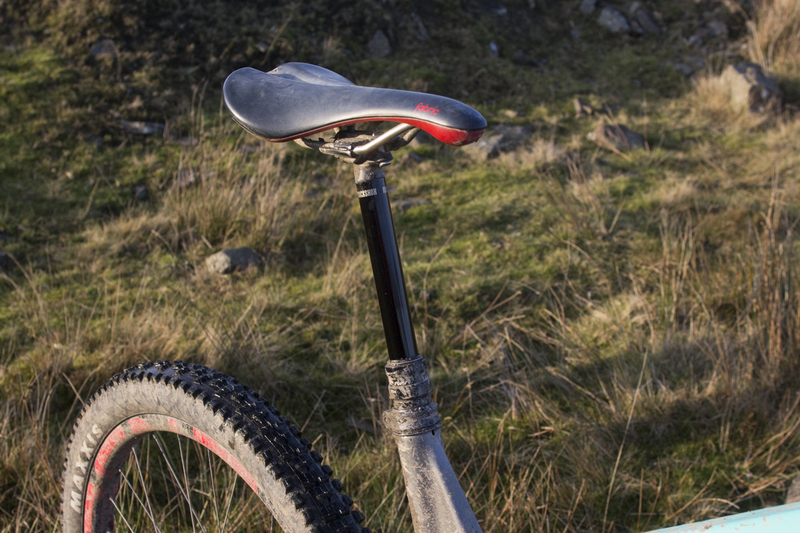 …but the seat tube is far too long for the Medium sized frame, causing fit issues for two of our testers. Our test bike has a 150mm travel dropper post fitted, and I found that even with the seatpost collar slammed down into the frame, the saddle height was still too tall for my legs when the Reverb was fully extended. Of course you can toggle the Reverb height as needed, but it’s an absolute pain in the arse – everytime I’d pop the saddle up after a descent, I had to then fiddle with the remote to get the seat back down 10mm or so. What’s a little strange about this is that at 5ft10in tall, I’m apparently at the upper end of Intense’s size guide. However, everything else about it fits well. Either Intense needs to spec a shorter 125mm travel dropper, or they need to lob off an inch or two from the top of that seat tube. 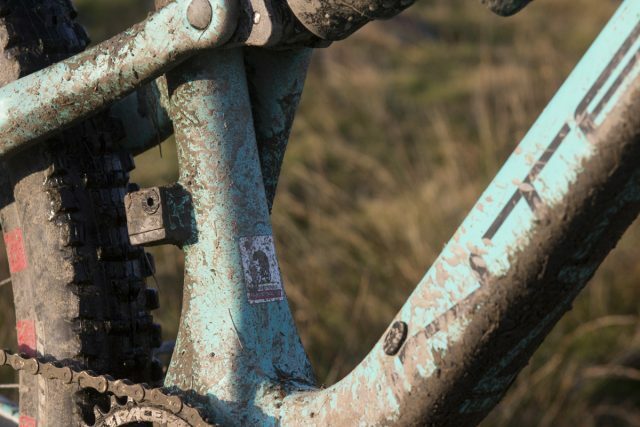 The Recluse is a technical trail bike at heart. My first impressions of riding the Recluse on our local trails were that it gave a bit of an armchair ride. It was stable and supportive, but not hugely inspiring, which made me think I hadn’t really found the bike’s natural environment. So I went looking for more challenging terrain. On the super steep trails at Nant Gwrthreyn, the Recluse perked up and came to life. Once gravity started to take over, the Recluse breezed through switchbacks with more grace than I deserved, with the short chainstays allowing you to push hard through the corners via the back wheel. On those steep and twisty sections of Welsh lift-assisted trail, it felt poised, supported and more than happy to carve corners with vigour. In fact, this is quite possibly one of the best cornering trail bikes I’ve had the pleasure of swinging a leg over. Point it downwards, and the long front centre oozes stability. Thanks to the reinforced edging blocks, the grippy High Roller II tyres do well to enhance the bike’s cornering tenacity, and the Intense carbon rims proved significantly more compliant than what we’ve come to expect from much stiffer carbon wheels from other brands. 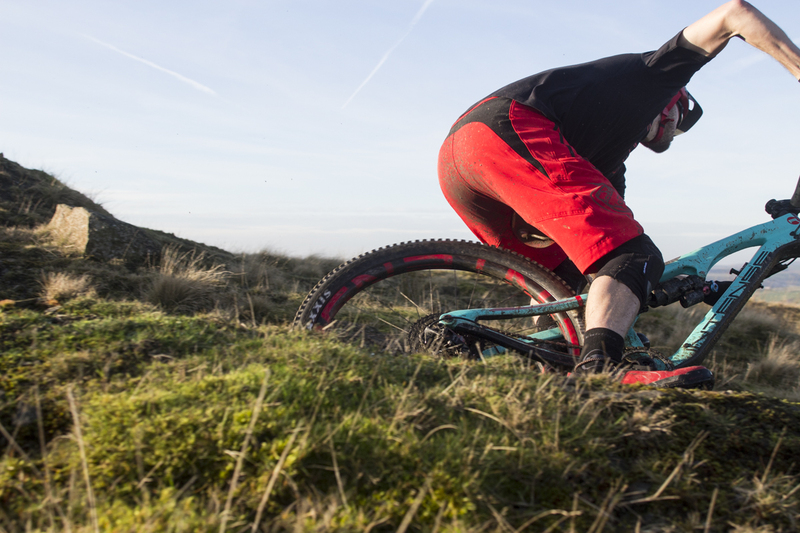 As such, smaller trail chatter has less of an effect on the overall chassis, allowing you to hold your chosen line without fear of being kicked off in another direction. The Recluse is firm and taut overall, but fine-tune buzz is filtered out nicely. Whereas some 140mm travel bikes feel spindly, the Recluse feels anything but. This thing is solid as. 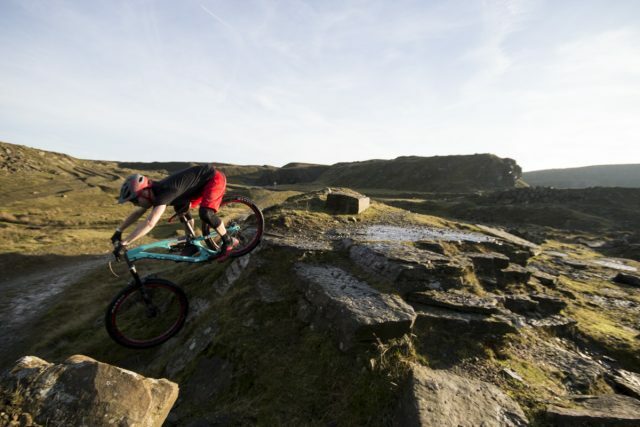 Sending the Recluse off of cheeky rock-drops on the way down, there’s certainly enough travel to get you out of jail most of the time, and the Float X2 shock plays a big role here in damping out fast and heavy landings. 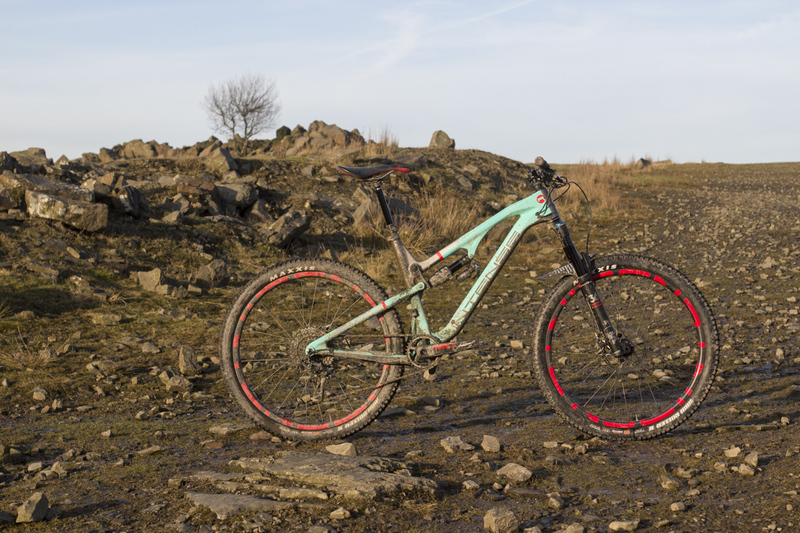 Even whilst rubbing shoulders with downhill rigs on actual downhill trails, it’s a bike that rarely feels out of it’s depth. That said, you’ll have to remind yourself that there is still only 140mm of travel. 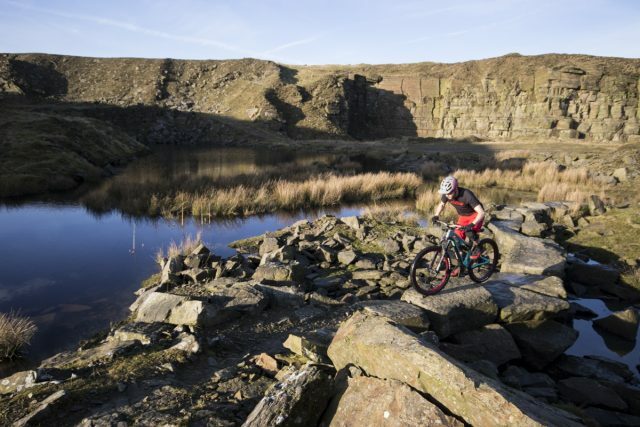 Because the capable Recluse can see you entering those technical sections with the pace of a much bigger bike, if you do commit a serious crime against your own riding skills, then expect to be bounced around accordingly. Carving corners is the Recluse’s forte. 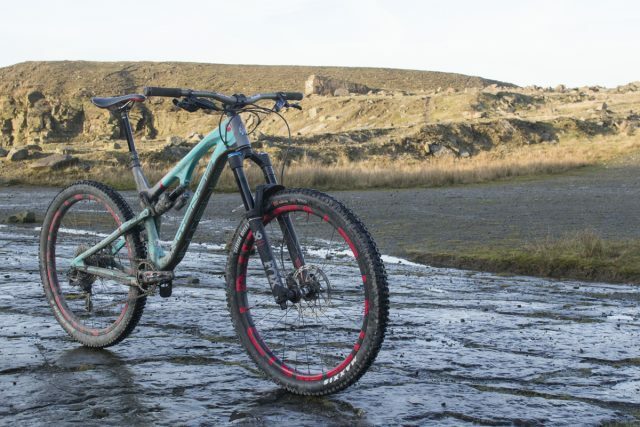 After trying (and failing) to find this bike’s limits on full-blown downhill trails, I took the Recluse back to some more traditional trail centre pistes to see how it behaved there. And here’s where the Recluse started to click into place. On smoother hardpack trails, the Recluse pumps and drives with enthusiasm. 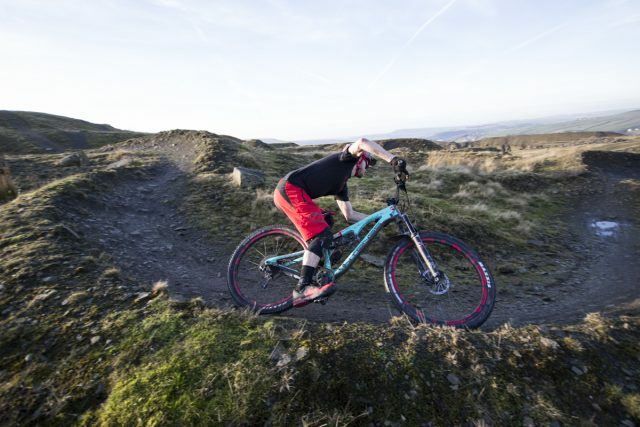 But whereas many 140mm travel trail bikes are comfortable being ridden at a variety of speeds on trails of different levels of technicality, the Recluse is a bike that definitely needs pushing to get the most out of it. You can cruise around on it all day and it will do everything it needs to do without rousing from ‘sleep’ mode, but to properly engage with its surroundings the Recluse really needs you to strap in and leave your comfort zone. Thanks to the stiff carbon frame and stubby rear end, the Recluse offers intuitive cornering abilities. The suspension itself isn’t hugely plush, but what Intense has achieved with the new JS Tuned design is additional support that means you can push off the suspension when required. 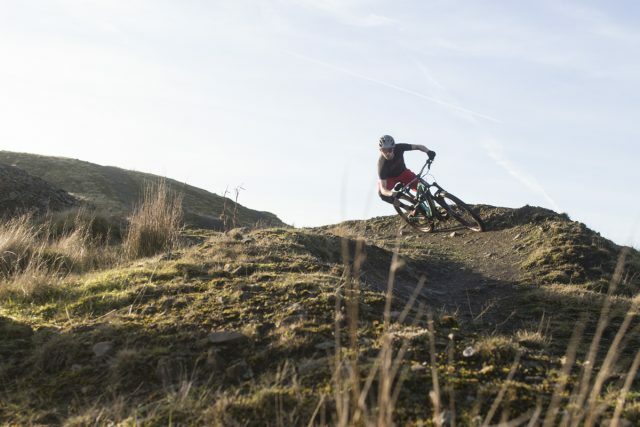 Unlike the mid-travel wallow that many previous VPP bikes suffered from, the Recluse exhibits a much more stable suspension curve that allows you to preload it into corners and on the face of jumps, knowing that the bike will spring straight back out of it. And the faster you go, the more playful and lively it feels. However, the Recluse requires you to ride it hard to get the most out of it. Push into it, and it’ll push back without hesitation. 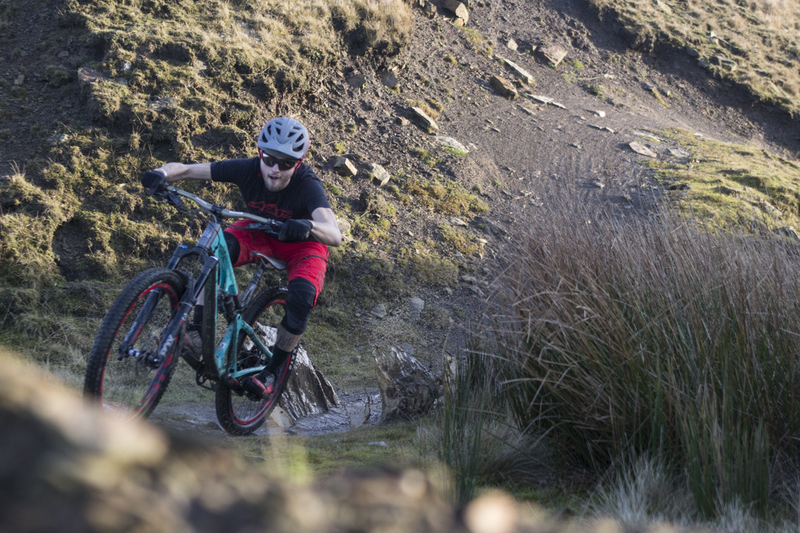 The flipside of the Recluse’ sharp handling and involving ride quality is that it does start to feel skittish on really high-speed descending trails. There’s no doubt that the short chain stays and high bottom bracket lift the overall centre of gravity and shorten the wheelbase length. As such, the Recluse is a harder bike to squat down low in these kind of top-gear situations. 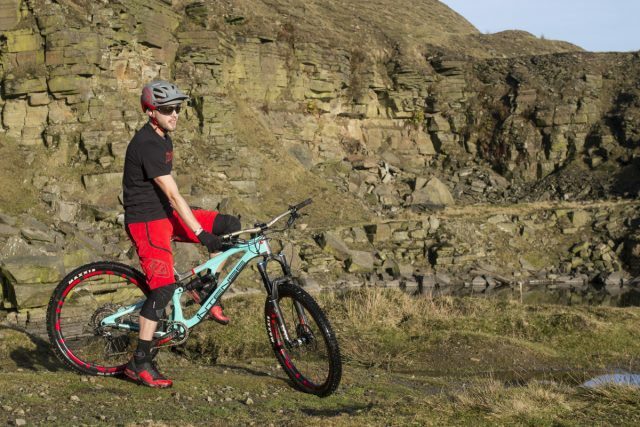 If you’re looking for a mini-DH bike, this isn’t it. Lean into the turns, and the Recluse will pop out of the exit with glee. On the flipside, one aspect of the Recluse that really impressed us was how efficient it pedals. 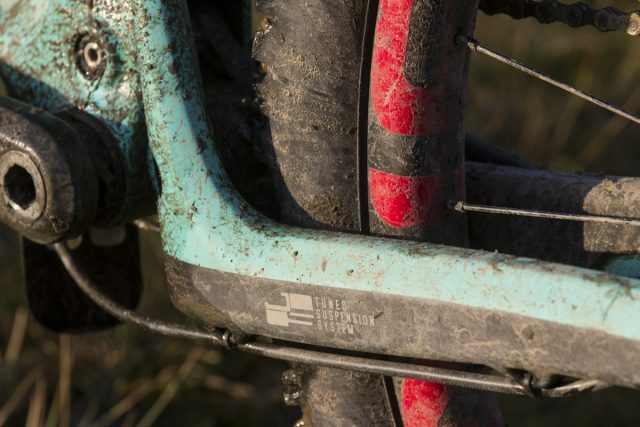 This is where the Spider 275’s DNA is evident in the back end of the Recluse, which responds to hard pedalling efforts with barely a hint of untoward shock movement. Along with the stiff and short back end, the Recluse shoots off the mark whenever you start driving the pedals downwards. The JS Tuned suspension design is mega efficient. No need to flick any levers on the rear shock. It is also an incredible technical climber. The kicked out front end does require some taming on steeper gradients, but the combination of the efficient suspension design, high bottom bracket and forward seating position allow you to drive the pedals so you can skip and hop your way up challenging rock features. Pedal strikes are a non-issue, and that meant I was far less likely to get halfway up a chundery climb before slamming a pedal into a rock and being forced to dismount. 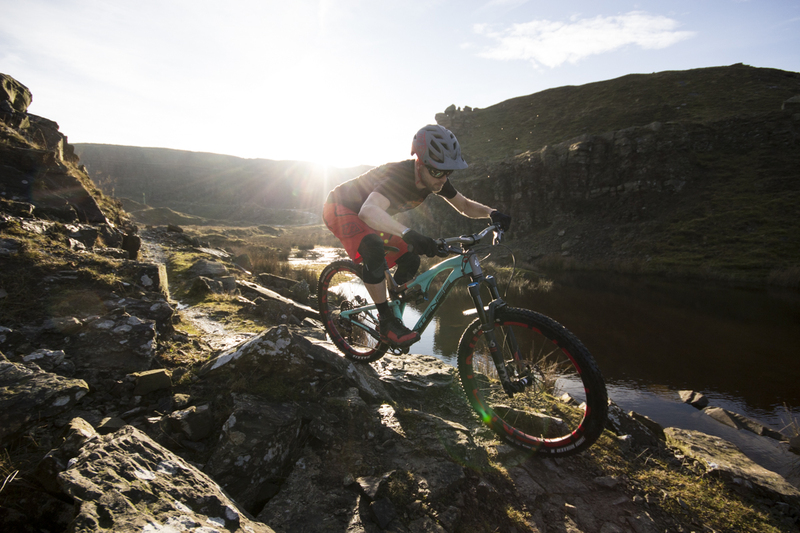 With the high bottom bracket and stable rear suspension, the Recluse will pedal over slab rocks with ease. If you’re thinking that there’s some overlap between all of these new models from Intense, then you’re not the only one. With very similar travel figures between the Spider, Primer and the Recluse, there’s certainly a lot of shared ground. 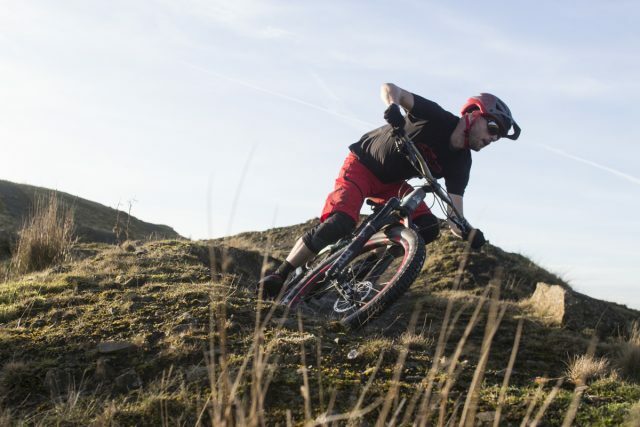 Overall that’s a good thing, because the new JS Tuned suspension design is a significant improvement, and Intense’s overall push towards shorter chainstay lengths and longer front centres has resulted in these new trail bikes offering more capability and more fun overall. 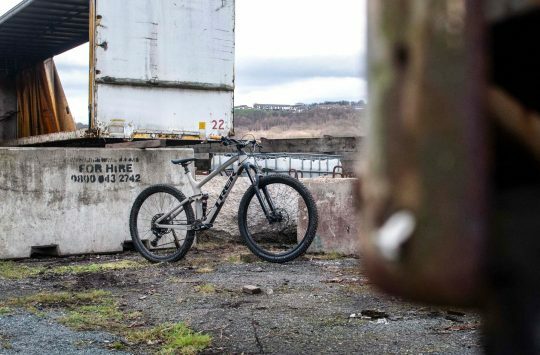 If you love a flickable and playful bike, the Recluse has got attitude in spades. Compared to the Spider 275, the Recluse possesses a much more potent and involving ride quality that begs you to push harder, and to ride with reckless abandon. It isn’t quite as sprightly as the Spider 275, and its longer front end requires you to ride off the front wheel a lot harder. 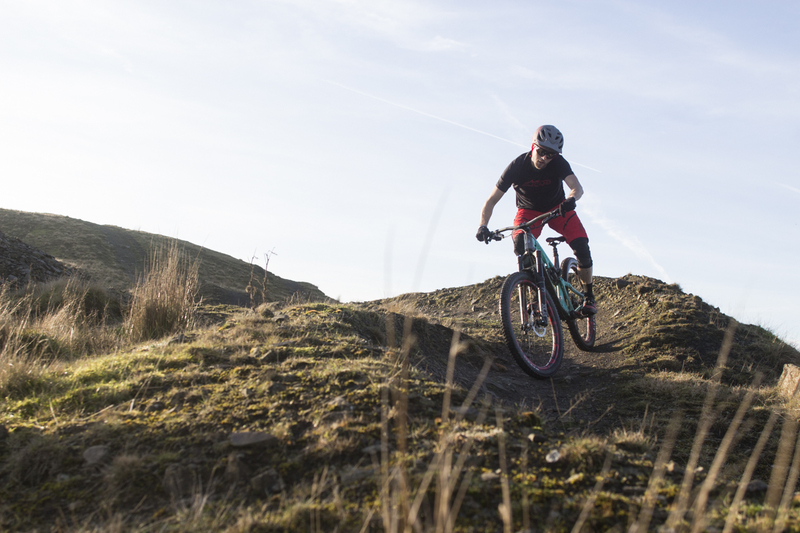 If you’re not an aggressive rider, and you’re in the market for a light weight all-day trail bike, then our pick would be the Spider 275. It’s surprisingly capable for its given weight, but it doesn’t require World Cup level skills to get into it. The Primer however, is a more difficult bike to pigeonhole. On paper, it should just feel like a bigger Spider. 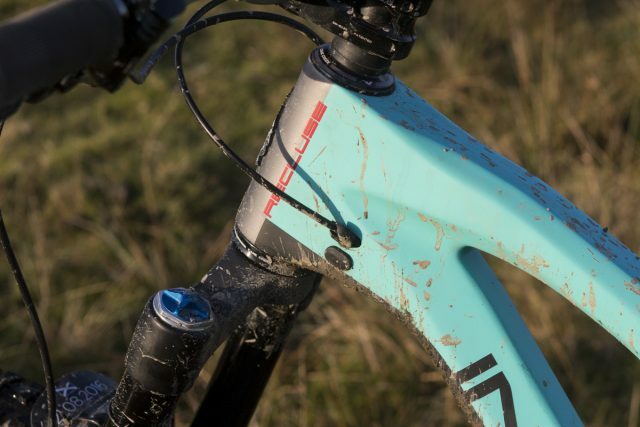 But somehow in between those large 29er wheels and the steady dynamic geometry, the Primer offers the kind of high-speed stability and poise that the Recluse doesn’t quite achieve. As such, the Primer has earned our praises for being one of the best mountain bikes to hit the market in 2016 – regardless of wheelsize. 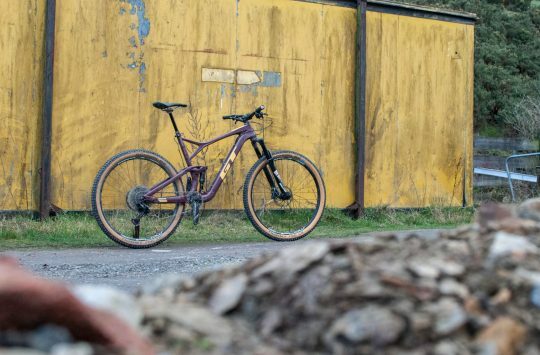 It’s no mini-DH bike, but the Recluse may just be the downhiller’s trail bike. 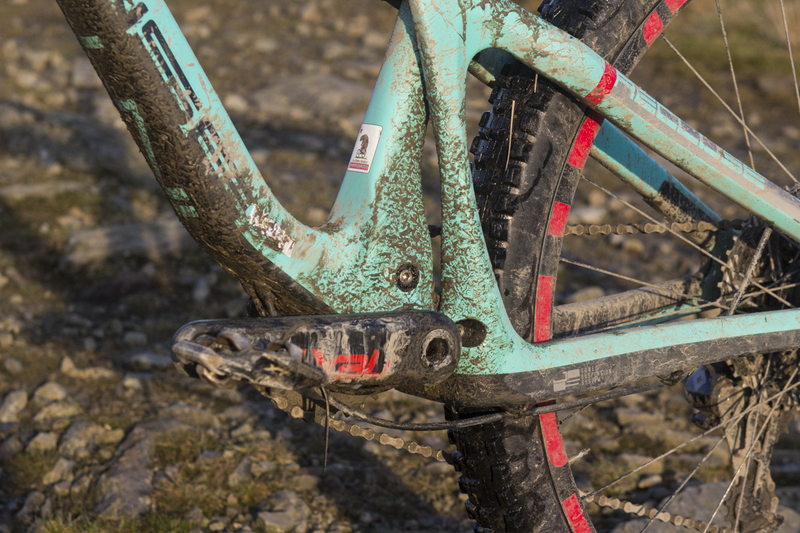 Despite not having 160mm of rear travel, it must be said that both the Recluse and the Primer are totally enduro-ready. They’ve got stout frames, excellent suspension, and suitably brawny build kits that will stand up to plenty of white-line fever moments. For flat-out descending trails and outright speed, the Primer would be our pick. 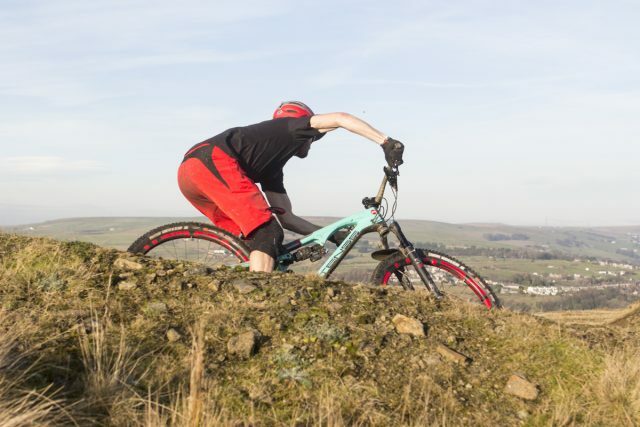 But for tighter and smoother trails that can benefit from a more animated riding style, that short back end on the Recluse delivers a more playful pop for letting it all hang loose. 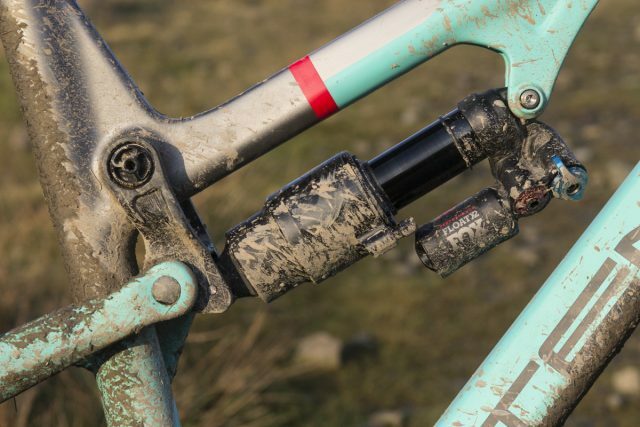 On the suspension, our Recluse Elite test bike was equipped with one of the original Float X2 rear shocks that underwent a warranty recall due to an incorrectly specced air can. Part way through testing, our shock was sent to Mojo Suspension for repair, and came back fully rebuilt with a new air can and a fresh lick o’ oil. Once bolted back onto the bike, the Recluse did feel noticeably better with the repaired shock. Partway through testing, our Float X2 shock had to go back for service under warranty. We also spent some time working on setup, as both the fork and shock provide you with a good deal of adjustment. For my 70kg riding weight, we went with 150psi in the rear shock, which delivered around 30% sag. As the Performance Series shock doesn’t come with the same high-speed damping adjustments as the Factory model, it only provides you with low speed compression and rebound damping. We set the rebound at 19 clicks in from full slow, and the compression at 21 clicks in from fully closed. The suspension package is super capable, but it takes time to get it setup properly. Although the rear suspension feel wasn’t buttery smooth, the X2 damper does provide masses of rear wheel control, and especially under fast repeated hits. The twin-tube damper allows for significantly more oil-flow than the single-tube version found in the regular Float and Float X shocks, and the result is more glue-like traction for the rear tyre. 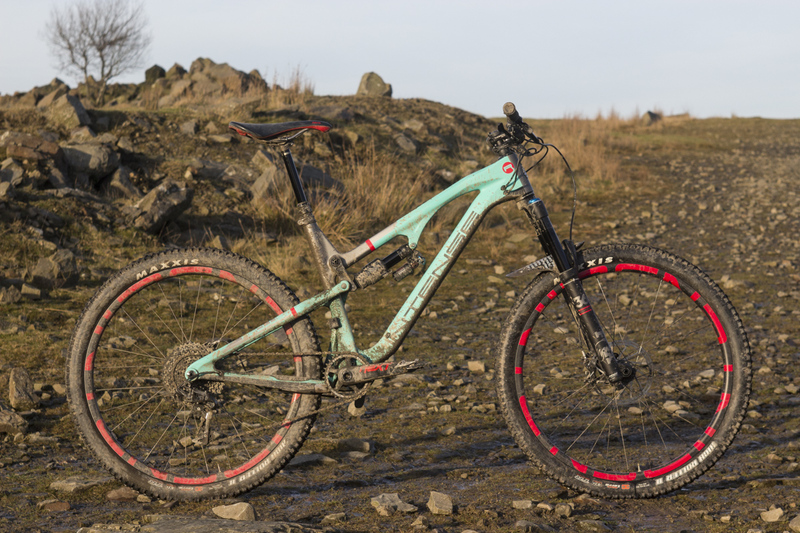 However, we’d love to give the Recluse a go with a conventional Float shock and the lighter 34 fork to see how much different the overall ride would feel. As you’d expect of a mountain bike costing over six grand, there is little you’d need to change out on the Recluse Elite. On paper, the 160mm rear rotor looked like a dubious choice compared to the burly look of the rest of the bike, but the SRAM Guide callipers are so powerful that the smaller rear rotor proved to be a good choice, and brake fade was very much a non-issue. 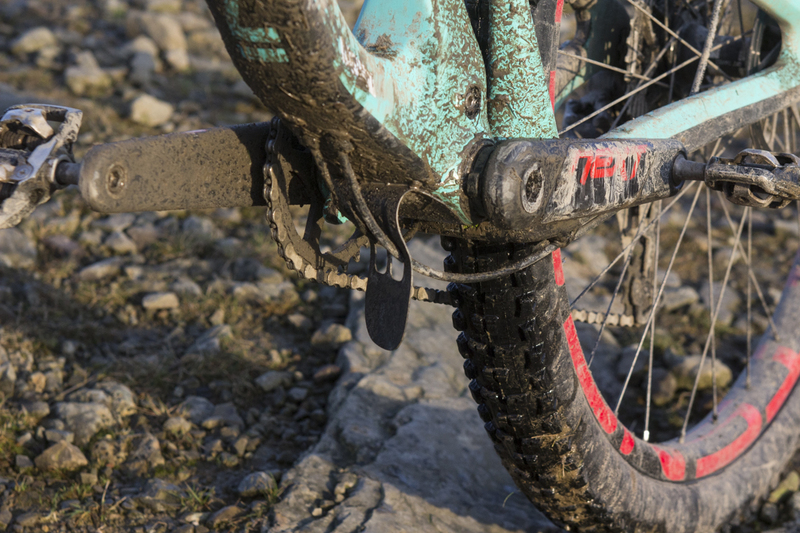 SRAM Guide RS brakes are powerful and easy to modulate. Thumbs up. 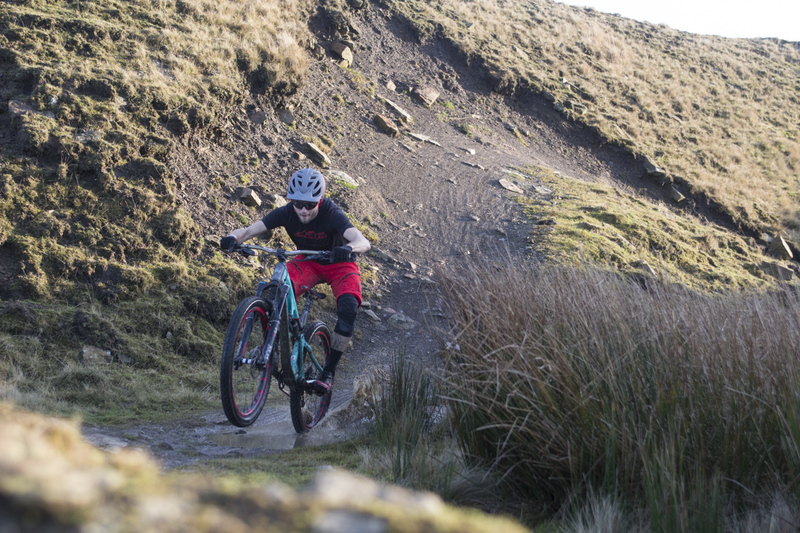 Shifting from the E*13 cassette was excellent, and the range delivered was much appreciated when riding our local steep valley trails, where a low climbing gear is essential to saving the knees. The thin rubber sticker doesn’t appear to offer much protection, and it peeled off anyway. However, the rubber port for the gear cable at the head tube didn’t seem too interested in going back into place after a crash tugged it out of the frame. Another minor irritation was the rubber belly armour underneath the downtube, which aside from being far too thin, actually peeled off within the first few weeks of riding. Not great for such a premium product. There’s not a lot of mud clearance around those tight chain stays, though you can fit up to a 2.5in tyre if you only ride in dusty conditions. One thing to note is that mud clearance is a bit of an issue with those short chainstays. A weekend of racing up at the Tweed Valley left the rear wheel jammed up on a couple of occasions thanks to the sticky wet clay-based trails. I guess that Intense probably wasn’t thinking about gloopy British conditions during the design phase, but some additional breathing room would be much appreciated, and particularly around that lower link that’s right in the firing line. That said, I did manage to just squeeze in a Maxxis Minion DHF 2.5in tyre in the back end to confirm the max tyre clearance, but I wouldn’t recommend running a big tyre like that unless you’ve never seen mud before. Once you understand it’s strengths and weaknesses, the Recluse is an absolute hoot to ride. The Recluse is a bike that we needed a good deal of time on to really work out its strengths and weaknesses. So much of this bike points towards it being an enduro bike, and many other riders were surprised to learn that it ‘only’ had 140mm of rear travel. Because let’s face it; when you slap a piggyback shock and a Fox 36 to any bike, it’s going to leave you with a few assumptions. The super short back end and stiff carbon frame work well together. The Recluse however, is not a bike built for high-speed sledding. 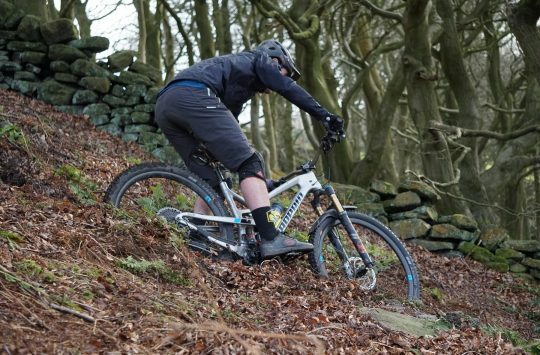 It’ll do that, but it isn’t as grounded as other bikes out there with longer and lower geometry. Likewise, it’s not a cruisy bike for pootling around on. Instead, this is a tough trail bike that delivers nimble handling and excellent technical capabilities. It pedals remarkably well, and it is a brilliant climber. For elevating yourself to higher ground before scoping out techy descending lines back down, the Recluse will do it time and time again. As long as you bring your A-game and put the effort in, the Recluse will dish out plenty in return. 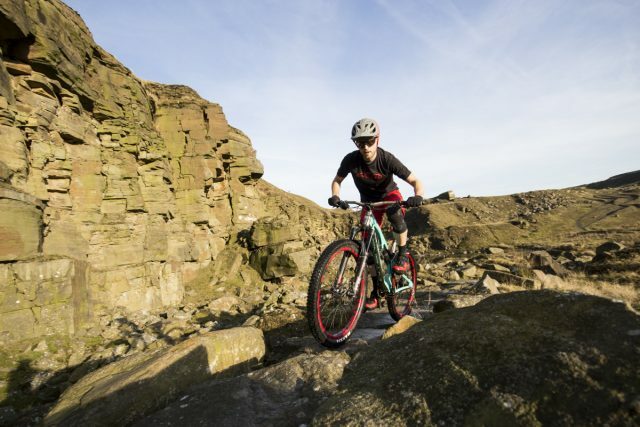 If you want a trail bike, Intense now has four distinct options to choose from, including this one.